On 5 April I had written an article reviewing the main developments during the first three months of the year and I had described it as an eventful Q1 mainly as a result of the ongoing saga of the 49.01% shareholding in Lombard Bank Malta plc held by the Special Administrator of Cyprus Popular Bank which finally culminated in an agreement with the National Development and Social Fund. The start of the second quarter of the year was equally eventful as HSBC Bank Malta plc issued an announcement also on 5 April making reference to reports in the local media which cited an article published the day before by the international news agency Bloomberg questioning the future global strategy of HSBC Group and their possible exit from Malta. However, HSBC Malta stated that it had no information in this respect and labelled such stories as speculative. The uncertainty surrounding this media speculation quickly impacted market sentiment with the share price of HSBC Malta sliding by 10.2% to its lowest level in several months of €1.67 and also leading to a visible downturn in share prices and equity volumes during the month of April. In fact, equity market volumes declined from €8.7 million in March to €5.6 million in April and the MSE Equity Price Index shed 4.3% – the largest monthly decline since November 2017. Despite the recovery in the past two months, the local equity market still ended the second quarter of the year in negative territory. 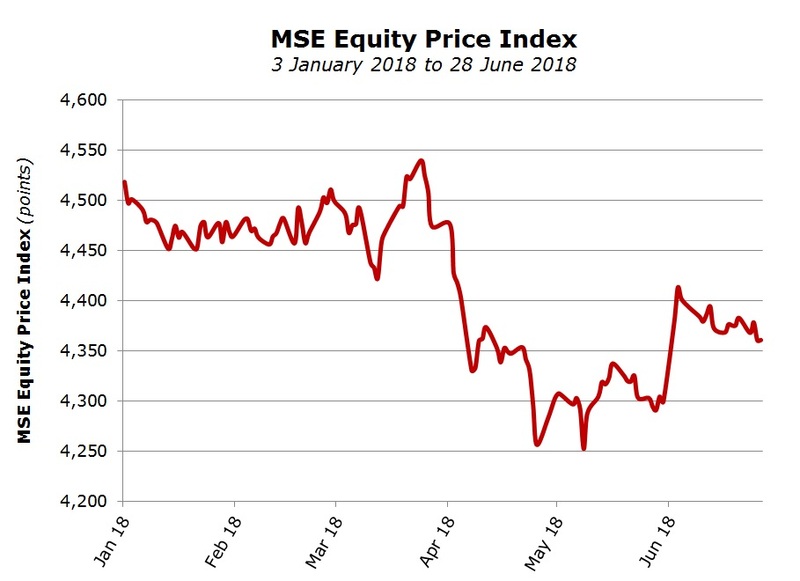 The MSE Equity Price Index shed 2.5% during the past three months while the MSE Total Return Index only eased 0.5% lower following the dividend declarations by various companies. Trident Estates plc ranked as the top performer during the first quarter of the year with a gain of 53.2% but moved to the bottom of the rankings during the last three months with a slump of 33%. No major announcements were issued by Trident in recent months apart from the publication of the 2017 annual financial statements which largely reflected market expectations following the spin-off from Simonds Farsons Cisk plc. There were four other equities with double-digit losses namely GlobalCapital plc (-17.1%), FIMBank plc (-16.5%), RS2 Software plc (-13.3%) and Santumas Shareholdings plc (-12%). GlobalCapital reported that it registered another profitable year in 2017 although the rights issue which was earmarked for earlier this year was once again delayed. Only six equities performed positively during the second quarter of the year and the star outperformer was undoubtedly MIDI plc with a rally of 37.6% helping the share price to finally surpass the 2010 IPO price of €0.45. The upturn in MIDI’s share price over the last three months commenced following the publication of the 2017 annual financial statements on 23 April showing an increase in the net asset value per share to €0.404 arising from the revaluation of the company’s shareholding in Mid Knight Holdings, the owner of ‘The Centre’. Meanwhile, towards the end of June, MIDI issued a further two announcements. It first published its updated Financial Analysis Summary in which it revised higher its 2018 financial projections. These are now showing that the estimated profits arising from the delivery of the new block of apartments due by the end of the year will boost the net asset value per share to €0.47 per share. Barely 24 hours after this announcement, MIDI stated that it entered into preliminary discussions with Tumas Group Company Limited to explore the possibility of establishing a joint venture for the development of Manoel Island. Although MIDI explained that discussions are at a preliminary stage and may or may not result in a successful outcome, the share price broke through the €0.45 level and ended the quarter at the €0.476 level after recording a new intra-day all-time high of €0.478 on the final trading day in June. During last week’s AGM, MIDI also confirmed that it is considering the construction of other properties on the land which is still vacant within the Tigne Point development. The share price of Malta Properties Company plc rallied by 17.5% during the month of May following the surprising announcement on 17 May of a possible acquisition of Dubai Holding’s majority shareholding in SmartCity (Malta) Limited. The equity then shed 5% during the month of June to end the second quarter of the year with a gain of 10.6%. The conclusion of the annual reporting season and the scheduling of the various AGM’s normally characterise the second quarter of the year. Apart from the customary publication of annual financial statements as well as the other important announcements made by Malta Properties Company plc and MIDI plc, the other two notable announcements in Q2 2018 related to the interim cash dividend declared by International Hotel Investments plc as well as the intention by the two major shareholders of Medserv plc to source a strategic purchaser for their combined 65.5% shareholding in the company. Moreover, during the second quarter of the year another equity was added to the regulated main market following the IPO of Main Street Complex plc. IHI’s share price advanced by 5% during the month of June following the declaration of the interim cash dividend at the start of the month. On the other hand, despite the news regarding the intention of the major shareholders to source a strategic purchaser, Medserv’s share price shed a further 9% during the second quarter of the year following the weaker-than-expected financial performance during 2017. Last week, Medserv also announced that it was awarded a second contract to provide shore base logistics in Cyprus to an international oil company. The summer months are generally characterized by lower trading activity despite the fact that many announcements will be issued by the end of August as most companies will have to publish their interim financial statements. Apart from these important company updates, other notable developments may take place during the third quarter of 2018. Following the news earlier this year regarding the agreement between the National Development and Social Fund and the Special Administrator of Cyprus Popular Bank regarding the latter’s 49% shareholding in Lombard Bank, there should be an update with respect to the pending approval from the regulatory authorities. According to an article published on 21 May in the local media, the sovereign wealth fund would then begin the subsequent process of the resale of these Lombard Bank shares which “was likely to be through a combination of an institutional pre-placement and a public offer”. Another change in a sizeable shareholding of a local credit institution is also likely to take place in the months ahead following the news earlier this year that Amalgamated Investments SICAV plc entered into a preliminary agreement with UniCredit S.p.A. to acquire UniCredit’s 10% shareholding in BOV. The other major development that the market is awaiting relates to the sourcing of a strategic buyer for the majority shareholding in Medserv plc which was made available by the two substantial shareholders earlier this year. In an interview with Medserv’s Chairman published last Sunday, it was revealed that several companies have already showed an interest by signing a non-disclosure agreement. Meanwhile, following the publication on 1 February of the indicative listing calendar for the regulated main market showing a number of new market offerings (both bond and equity), other new issues may be announced in the months ahead. Following some evident delays by a number of potential new issuers during the first half of the year, a further update to the listing calendar by the Malta Stock Exchange would be helpful to market participants and all categories of investors.